The Netherlands; Late 15th Century. Latin Text; Lettre de Forme. In the 15th century Books of Hours were as much in demand in the Netherlands as they were in France and England. In many of these books it is difficult to distinguish the Dutch Hours from those of Northern France or the Rhineland. In the middle of the century this whole area was interested in naturalism and made its illustrations so vivid that sometimes they approached those of our seed catalogues. It is not difficult to recognize carnations, pansies, columbines, and strawberries. The style later became even more realistic when the naturalistic flowers were painted with cast shadows. When such flowery decorations are found on a rather heavy piece of vellum, entangled with the swirling acanthus leaf and accompanied by a heavy lettre de forme script, one can be fairly safe in assigning the leaf to the province of Brabant. It was a difficult technical achievement at this time to apply the gouache colors to gold leaf so that they would adhere without flaking. 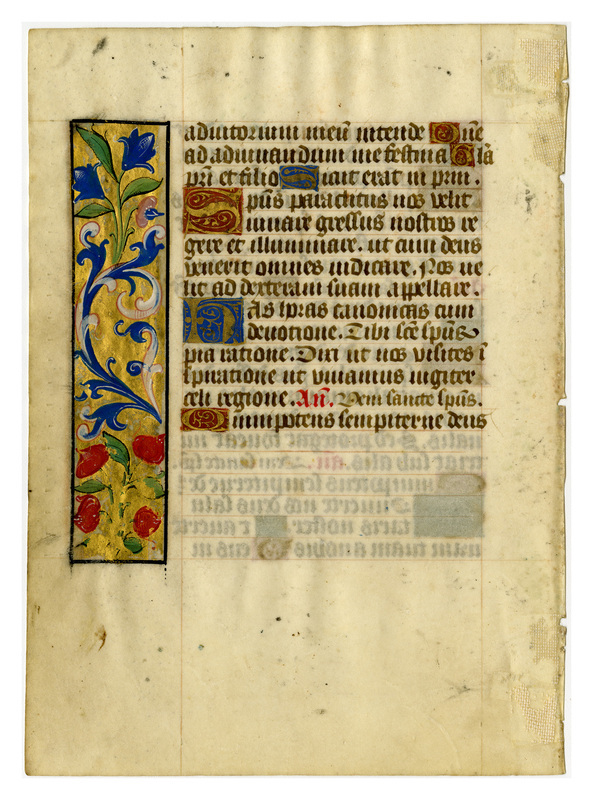 Compared to the other specimens of fifteenth-century Books of Hours in the portfolios, this one contains highly "itemized" pages: the red ink used for the rubrications sharply contrasts with the brown ink; several 1- or 2-line initials rendered in gold on a background of blue or red bring light into the text block of most leaves; and many lesser first letters are filled with yellow. Despite this lavish plan, all leaves from this manuscript show evidence of problematic adherence of the gold leaf, and/or incomplete decoration or text. 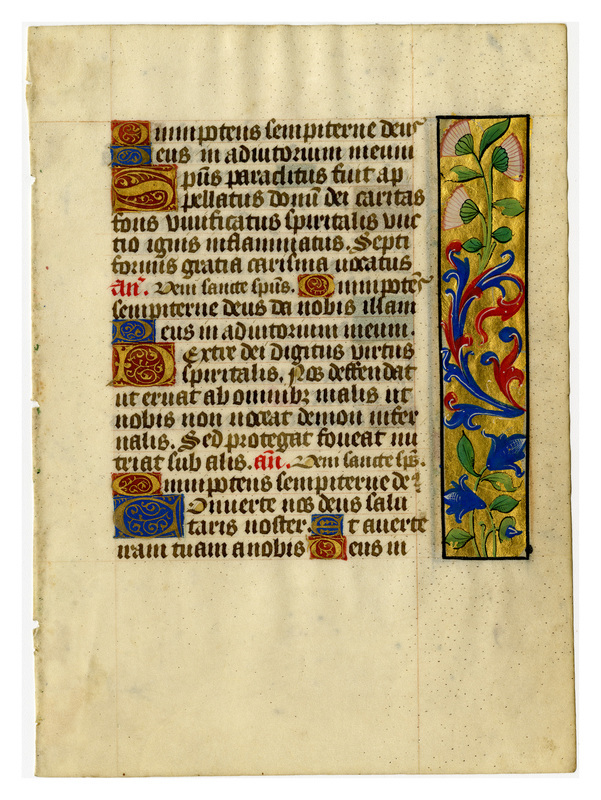 “E0048 Leaf from a Book of Hours (Horæ Beatæ Mariæ Virginis),” Digital Exhibits | Denison University Archives & Special Collections, accessed April 23, 2019, http://exhibits.denisonarchives.org/items/show/68.